Give a DIY Catio Plan to the cat lover in your life! 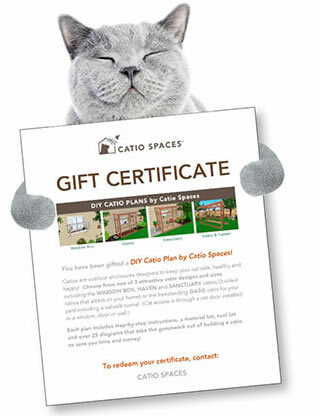 Purchase a certificate redeemable for a DIY Catio Plan by Catio Spaces and the lucky recipient can choose one of the Window Box, Haven, Sanctuary or Oasis catio plans. You’ll receive a pdf download of the gift certificate including instructions for the recipient to redeem their catio plan. Whether they build the catio plan themselves or hire a carpenter to build it for them, Catio Spaces takes the guesswork out of building an outdoor cat enclosure to SAVE TIME AND MONEY! Roof rafters accommodate a wire mesh roof or a clear, polycarbonate weatherproof roof for year-round enjoyment. Door placement options for human access into the catio. Shelf design maximizes vertical space for cat exercise and enjoyment. See specific plans for dimensions and design features. Tips for acclimating your cat to a cat door and new catio space. Tips for cat safe plants, enrichment, decorating and more! All DIY Catio Plans are a pdf download so you can get started right away! Purchase your Gift Certificate for a DIY Catio Plan today! 10% will be donated to an animal welfare organization. Meet some happy Catio cats! See our before and after catio transformations!